Currently the only two states in which incarcerated individuals have the right to vote. In Maine and Vermont incarcerated individuals never lost their voting rights. These two states also have the whitest prison populations and with the realization that policies never came to strip the rights of incarcerated citizens in the north-most region of the east cost, the argument that prisoners lose their voting rights as a form of punishment for their ‘breaking social contract’ is false looking at our reality. It’s also worth noting that incarcerated citizens’ loss of voting rights wasn’t a standard practice in the United States. Many states did not start stripping away prisoners voting rights until 20 years ago during the drug war’s rapid increase of the number of people of color in prison. During my visit in New Jersey I was surprised when I got to Nash Theatre at Raritan Vally Community College (RVCC) to find that students took the lead in organizing And Justice For All, an evening of art and conversation on social justice and equality. This fundraiser supported the work of the New Jersey Institute for Social Justice (NJISJ), the leading organization behind A3456 and S2100 to restore the voting rights of individuals, not only while they’re on parole, but also during their time in prison. When I read the flyer that promoted the event as a “conversation” I expected a panel discussion where panelists sit at a shared table in guided discussion while addressing audience questions, but this social justice conversation was like nothing I’d ever been too. Ryan Haygood, president and CEO of the NJISJ began the program sharing the devastating wealth gap that exists between white and black families in New Jersey. With whites earning an average of over $300,000 and blacks earning just less than $10,000. New Jersey’s wealth income gap is an outrageous representation of what is happening all across the country. An indisputable large contributing factor to this is the number of potential household earners from Black families that are locked up in prison where inmates are often exploited for their labor. Had the jobs that prisoners are forced to work in prisons for pennies an hour, been offered in their communities at the prevailing wage, many would have never ended up behind bars and many families would not have been broken. Currently in New Jersey individuals voting rights are not restored until after finishing their parole. Voting rights are a critical aspect to citizenship that allows citizens within a democracy to participate in the legislative processes that govern their lives. Incarcerated members of our democracy are completely barred from that process and RVCC students argued in performance that this was by design. They creatively used this event as an opportunity to explain the process of disenfranchising Blacks in the United States and the effects that it continues to have on African American communities today through song, dance and skit . Karen Gaffney of the Meta Theatre Company performed a skit to excepts of her book, Dismantling the Racism Machine, explaining the way that disenfranchisement has worked to divide the working class that was once united against the elite class with the construction of race as a new social order to create a racial hierarchy. The skit ended with a call for reparations, the only direct way to answer this injustice. Along with skits, dance was another method of discussion that was performed during the event. 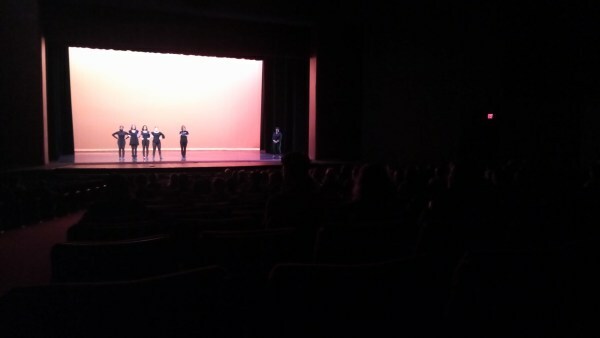 An interpretive dance by Kyle Marshall to Martin Luther King’s speech, “If I would have sneezed” was incredibly moving. I realized while sitting in the auditorium watching his performance that there are many more ways to hold discussion than simply talking at one another. Marshall’s dance spoke to me in a way that panelist would not have otherwise. The creative way that RVCC students offered themselves to educate its audience was unexpectedly breathtaking. The loss of incarcerated citizens voting rights in Massachusetts aligns perfectly with the War on Drugs’ mass incarceration of minorities. 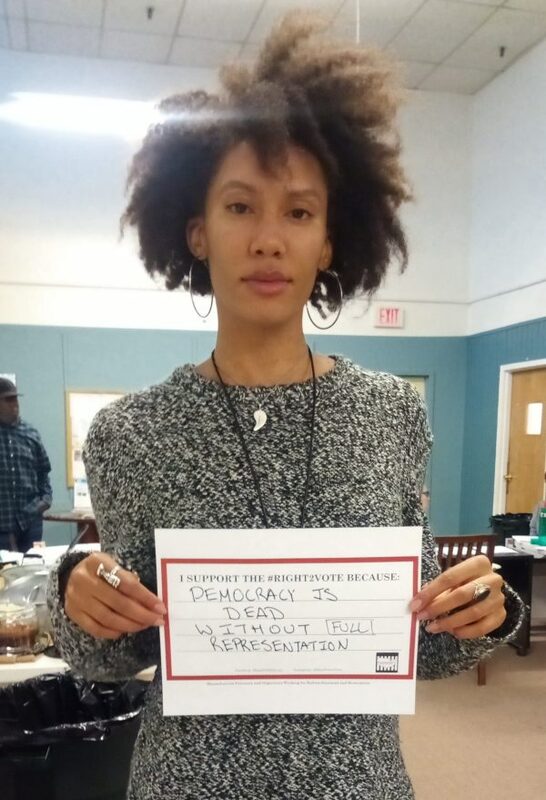 There are people incarcerated in the state of Massachusetts who were incarcerated during the law change and remember the time when they could cast their ballot before the laws changed during the Drug War. The MASS Power Kickoff rally was hosted in collaboration with Emancipation Initiative, Families for Justice Healing, the African American Coalition Committee out of Norfolk Prison and the Harvard Prison Divestment Group. The event was opened up with a recorded speech from EI founder, Derek Washington who shared that in support of restoring prisoners voting rights, “there must be some dignity in accordance with being human”. 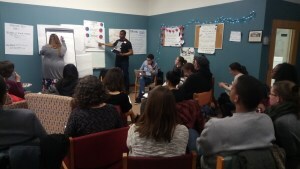 Organizers were intentional about including the voices of their incarcerated members while educating attendees about the process that suppressed their voices. Along with breaking down Massachusetts’ state legislative process, organizers split attendees into three workshops that focussed on preparation for their upcoming committee hearing on April 10 for S.12, their Vote for Me Campaign where outside community members vote on behalf of EI members they are matched with and their Petitioning Campaign for which they’ve planned to collect signatures to initiate legislation to go onto the ballot while the current bills go through the slow hearing process. Organizers in Massachusetts, knowing potential resistance that may come as they push forward, are tackling the right to vote issue from every end. It was inspiring to see the number of residents that came to participate in the event from all ends of the state. People were genuinely interested in doing whatever they could to organize on behalf of this issue. In both states students have taken the lead in raising awareness surrounding this issue. It’s evident that the millennial generation holds different values as it relates to the operation of democracy, the majority of whom believe in a true democracy in which every citizen has a voice. There are too many regions where prisoners bodies are counted for funding and resources in communities where their voices aren’t heard and they therefore have no access to those resource for which their numbers were a contributing factor in attaining. Especially in these rural towns where large prisons are built in which the population far outweigh the number of individuals on the outside. For those in states that recognize this issue where voting rights legislation has yet to be introduce I encourage students to form a call to action. Even if it is only a small meeting at your university to discuss the issue, the potential outcomes are immense. Jailhouse Lawyers Speak, the incarcerated activists leading this campaign have put out a call for events during Smash White Supremacy Week, May 12-18th, this would be a perfect time to organize events related to their call. For educational institutions, like Havard University, that have investments in the Prison Industrial Slave complex, students should form a divestment group like that of Harvard’s Prison Divestment Group* Students, like Garret and *, took the initiative to organize around an issue that they disagree with at their university. Students, as the primary funders of their university have the authority and responsibility to call out those places where their money is going that they do not approve. College students and prisoners are very similar and students both groups can find beautiful empowerment in the connection. Prisoners, ‘like students, are the largest population on their campuses that provide the funding and labor necessary to keep their institutions running. For collect students their tuition: whether that be from their own pocket, their parents, the state/taxpayers through FASFA funds or private scholarships and loans; pays the bills at the university. For prisoners their body is the product by which the state/taxpayers supply funding to keep imprisoned. Along with their presence providing the primary source of funding for their institutions, both students and prisoners are the primary source of labor (cheap labor, respectively) at their institutions. As we know from the National Prison Strike’s Demand 2 prison slavery is the facet by which every prison keeps its facilities clean, lawns maintained, laundry washed, food served, etc. Many third party groups such big corporations like McDonalds, Wal-Mart & Victoria’s secret also profit from paying people pennies on the dollar/hour for their labor while incarcerated. As for students, I myself was a student worker, paid below minimum wage for my time as a mentor to incoming students. Students act as mentors, advisors, low level administrators and tour guides. Both groups do so for lower wages than average happily under the assumption that they are gaining valuable skills for their ‘release’ from their enclosed world into the real world once they’re done with their pre-determined residency. Student’s obviously are treated with more dignity and respect throughout their transition than prisoners. However, like prisoners, they fail to recognize their powerful influence within the institution that profits off of them. Studying citizens in partnership with incarcerated citizens can radically transform these exploitative systems, beginning with restoring prisoners right to vote. Both groups recognize the potential voting bloc that exists. Many students have restored their faith in the civic process through their work on behalf of prisoners rights. I myself, like many millennials grew up skeptical of the system, but realizing that in our lifetimes the rights of our comrades inside have been stripped, fuel our desire to engage with the civic process through making sure that their rights are restored.